We're just barely feeling the beginning of spring, but the eagles and owls have been busy since January with their spring chore of creating offspring. Which means it's time to tune in to nest cameras. The magic of remote cameras — or cams, as they are called — focused on nests worldwide give us all a front row seat for the majesty that is bird reproduction. It's a very intimate view, and the chicks, when hatched, are adorable. The cams in U.S. locations also allow viewers to follow the progress of the seasons as spring arrives slowly from Florida to the north. 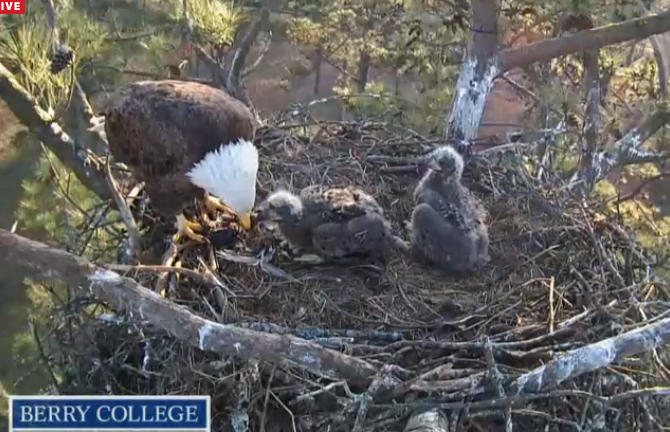 Right now, for example, you can already check in on bald eagle chicks at Berry College in Rome, Georgia. On the other hand, the eagles covered by a camera in Alaska have yet to start courting. At Berry College, the adults returned to the nest last September and were incubating eggs by Jan. 9. They welcomed two chicks by the middle of February and now the hatchlings are already growing adult feathers. Closer to home, in southeastern Pennsylvania, at Codorus State Park near Hanover, the eagle pair is still incubating. "Hatch watch" for their two eggs starts this weekend. Waiting for hatch to begin is probably the most nerve-wracking thing for cam addicts to endure. Everyone knows those babies are ready to emerge so people are glued to their computer screens looking for any signs of a pip — the small hole in the shell made by a chick's egg tooth, a hard projection on the beak used to crack the shell. When it is finally observed, the chat streams and Twitter feeds devoted to the nest light up with oohs and aahs. The frenzy peaks when the chicks are successfully out of the shells. The Hanover cam, installed by the PA Game Commission, is a next-generation HD camera that makes for a mind-blowing crystal clear view. 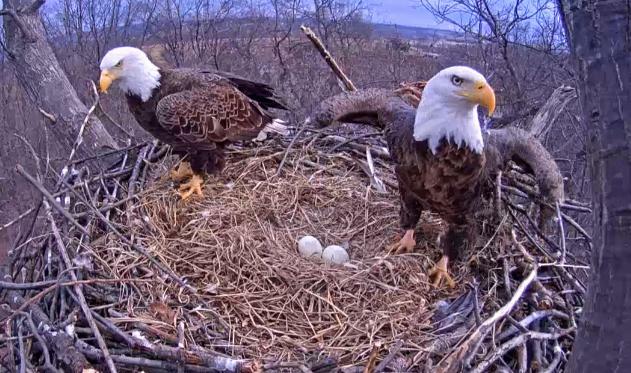 A healthy number of other eagle nests are available for your viewing pleasure, too. Hays, Pa (near Pittsburgh) This pair laid two eggs, but one was lost. Hatch watch starts on March 24. Decorah, Iowa These eagles have three eggs. Hatch is expected starting April 2. Central Minnesota Three eggs are being incubated, but hatch watch won't start until April 13, as this nest is farther north and the first egg wasn't laid until March 7. While the bald eagles are thrilling to watch, other birds and nest scenarios are just as interesting. Stop by the great horned owl cam in Savannah, Georgia. to watch two very cute owlets try to figure out how those crazy wing things work, and if you want a short trip to the tropics, tune in to the Laysan albatross cams in Kauai, Hawaii, where young albatross are tottering around under the careful eyes of very large parents. The cameras close to home are the most fun for me — I feel more invested in their success. Peregrines — a type of falcon — are listed as a state's endangered species so there is great pleasure taken around the state when a successful brood fledges. Although Erie has a peregrine couple that nest on the bayfront, there is no cam on them (a girl can dream). To satisfy my need for baby falcons, I tune in to the three peregrine nest cams in Pennsylvania. Two pairs in Pittsburgh, at the Pittsburgh University Tower of Learning and on the Gulf Tower, are still in the their courtship phase. 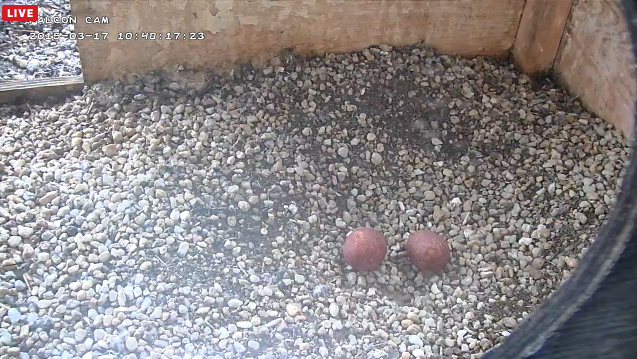 The pair in Harrisburg, nesting on the Rachel Carson State Office Building, has laid two eggs so far. They could produce up to four in this clutch. Falcons that have taken to urban environments nest on roofs and ledges of tall city building or under bridges that mimic the cliffs they traditionally chose as nest sites. Don't expect traditional baskets of twigs here. Peregrines use a what's called a scrape, because it's made by the birds rearranging rocks and gravel with their claws. We can't expect hatch for the Harrisburg peregrines until approximately April 22. Until then you can watch mom and dad falcon snuggle down over their eggs to keep them warm, periodically roll them over so all sides stay evenly warm, and conduct displays of affection and nest exchanges. We will be watching carefully, and waiting patiently and if you are wise, you'll be marveling at how powerful nature is.